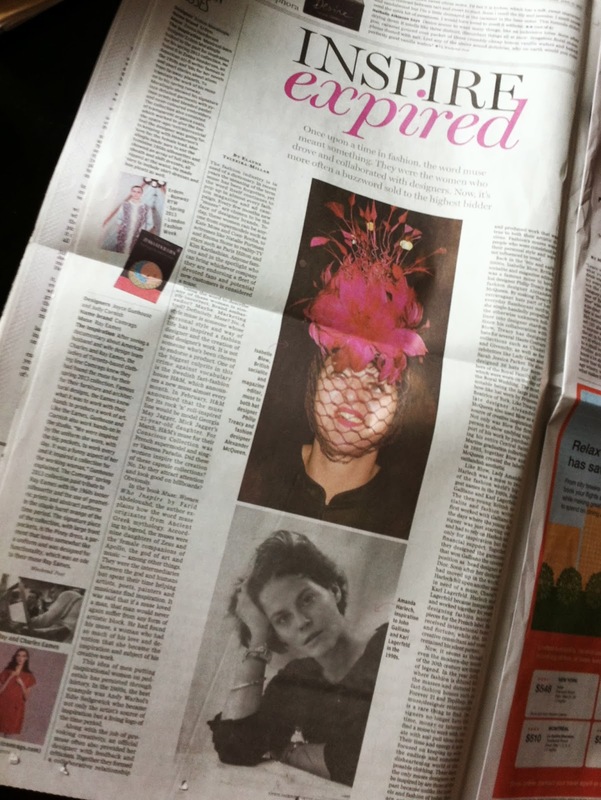 The last feature story I wrote for the National Post was a full-page fashion feature about some of history's most famous (and in some cases totally eccentric and amazing) fashion muses. 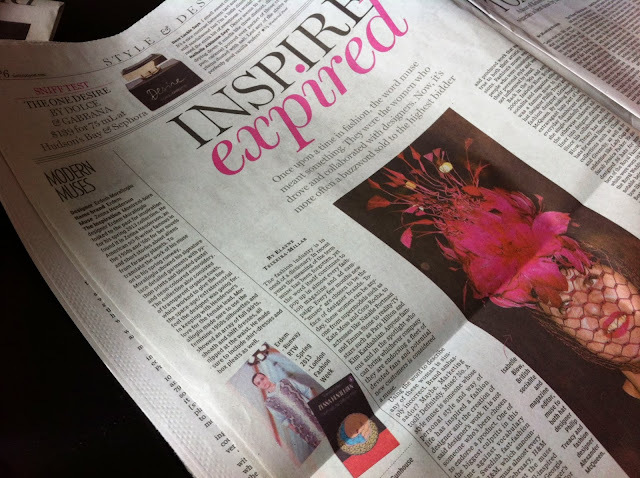 It was published in the Weekend Post back in April and I totally forgot to blog about it...oops. It never made it on to the website, which is kinda weird because everything normally goes straight to the web these days and little is ever actually filtered out. The story must have just been overlooked (sad face). But whatever. My story made it to print in one of Canada's biggest national newspaper, if not the biggest (nice job Layne.) So I don't feel too bad about it. Since there isn't an online link, I guess everyone will just have to enjoy the lovely photos I took of the article in the paper. If you're feeling adventurous you can try and zoom in/piece the paragraphs together. Bahaha have fun! "In the 1960s, the best example of a more modern muse was Andy Warhal’s Edie Sedgewick who became not only the artist’s source of inspiration but a living logo of the time period. Along with with the job of provoking creativity, an official muse often also provided her designer with feedback and criticism. Together they formed a collaborative relationship and produced work that was true to both their artistic visions. 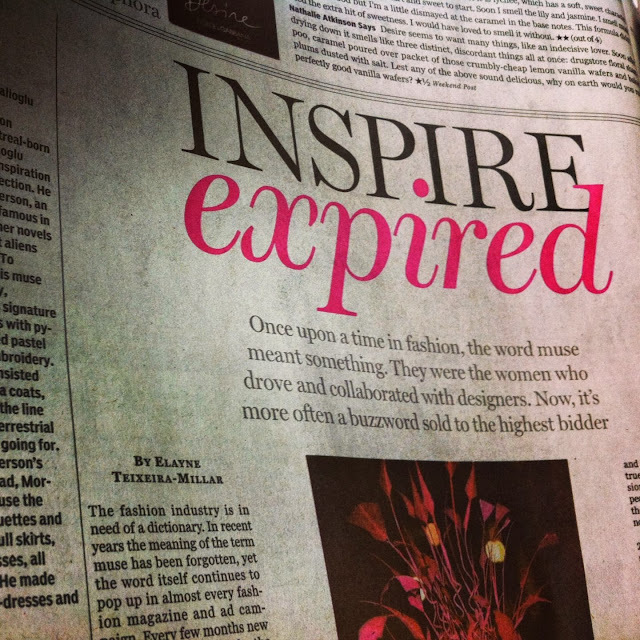 Fashion’s muses were people who were consistent in their personal style and were not influenced by trend." "Back in the 90s and early 2000s Isabelle Blow, British socialite and magazine editor, was a famous muse to both hat designer Philip Treacy and fashion designer Alexander McQueen. By making Treacy’s extravagant hats part of her everyday flamboyant outfits, she single-handedly propelled the otherwise unknown milliner into designer stardom. Since his collaboration with Blow, Treacy has designed hats for several Haute Couture collections like Chanel, Givenchy, etc, as well as for celebrities like Lady Gaga and Sarah Jessica Parker. He also designed 36 hats for members of the royal family, all of which were worn on the day of the Royal Wedding. The most notable being the large pink bow-like hat worn by Princess Beatrice of York. Like Treacy, late designer Alexander McQueen also used Blow as a source of creative inspiration. Not only was Blow the first person to show undying support of his work by purchasing his entire Central Saint Martins graduation collection in 1995, together Blow and McQueen created the label’s outlandish aesthetic. Like Blow, Lady Amanda Harlech was a muse to two of the fashion world’s biggest names in the 1990s, John Galliano and Karl Lagerfeld. The then young British socialite and fashion writer first worked with Galliano in the days where the young designer was just starting out and had to rely on Harlech no only for inspiration but for financial support. Together they designed the garments that won Galliano the coveted position as head designer at Dior. Soon after her designer had moved up in the world, Harlech fell upon another man in need of a muse, Chanel’s Karl Lagerfeld. Harlech and Lagerfeld became inseparable and worked together for years designing fashion masterpieces for the French label. He received international fame and fortune, while she, his creative consultant and muse remained his silent partner."